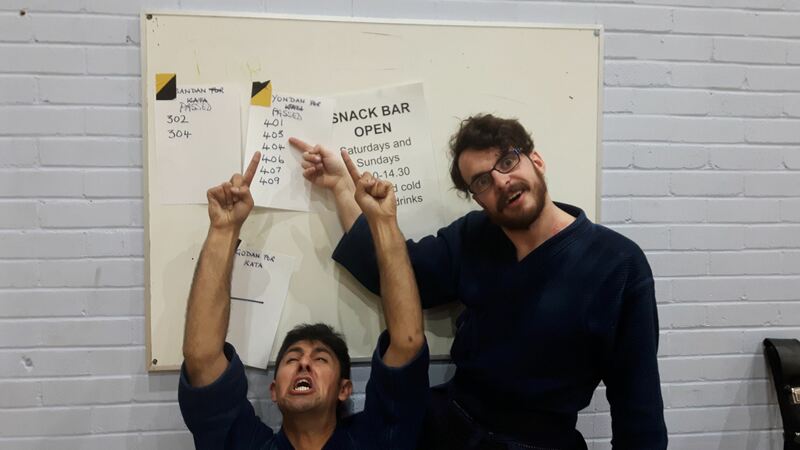 We have one of UK kendo year’s biggest grading exams coming up next weekend at my own dojo, Mumeishi. This one goes up to 5th dan there are nearly 90 candidates registered. I have recently sat in on a number of practise grading sessions and whilst I have seen some good kendo there are a few errors that people fall into time after time. One of these seems to happen mainly with people taking ikkyu and shodan and is a reasonably new phenomenon. Candidates are taking turns in opening up and letting their opponent hit them, as if they were doing uchikomi-geiko. The alternative seems to be that the two fighters use the limited time available to perform a series of ai-men, hitting each other at the same time. What the jury will actually be looking for is the ability to take or make the correct opportunity to attack as well as the ability to show correct basic technique. Going up the grades, the big danger is attacking too much, particularly at times when no opportunity exists. Two or three successful attacks are all you need, especially if you are aiming for 4th or 5th dan. (Sueno sensei recently suggested that you need to hit 5 times to make 2 clear ippon). Show that you can break your opponent’s centre and take clear points. Be careful of your chakuso. Make sure that all your equipment is tied neatly and correctly. Watch the length of your men-himo and ensure that loops and descenders are of equal length. Make correct rei and sonkyo. You should take kamae at the same time as you make sonkyo not before or after. You must not attack when there is no opportunity and you must attack when there is. Commit 100 per cent to any attack you make. Ensure that your kiai is strong and that you make sae on hitting. Ensure too that your zanshin is present on every strike. If you miss, keep good posture as you move through after the attack. A missed point with good posture and kiai can be more impressive than a poorly executed hit. If kirikaeshi is part of your exam strike sharply and accurately and make sure that you do not cross your feet when you step backwards. Do not try techniques that you are not yet good at. Oji do is a good example. Few people do this well and many others try it in gradings. Even if it means relying solely on men, do only what you can do well. If you are taking this or any other grading next week, do not attempt to make major changes to your kendo. Do the best you can with what you already have and keep these few tips in mind. Oh, and good luck on the day! Fresh from yet another seminar and grading examination yesterday, I was asked for feedback by a number of people who passed. My apologies for not providing this, but I feel it is more important to use the time available between signing menjo and taking the long drive home to explain to the candidates who were not successful what they need to change to pass next time. 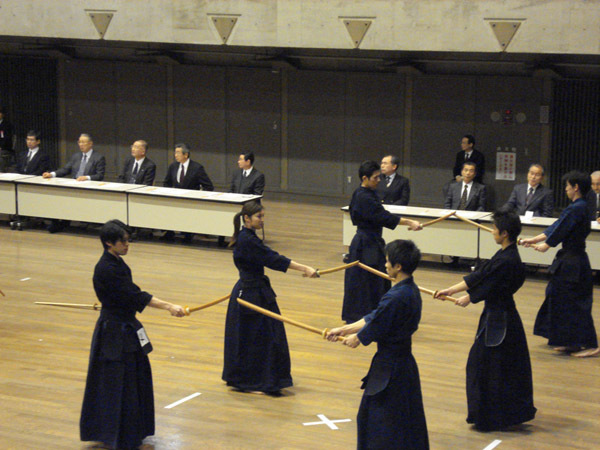 It is of course disappointing to fail an examination, but it is not an uncommon occurrence in kendo. The higher you move up the grade ladder the lower the pass rate. However the difficulty of passing certain grades is not common to everyone and different people reach there “wall” at different points. I have known people to get stuck an 4th dan for 14 attempts and then pass 5th 6th and 7th dan exams first time. I am only too familiar with the moment when successful candidate numbers are posted on the wall and yours is not there. Reactions can range from resentment at the panel being so strict to self-recrimination for getting it wrong yet again. The healthiest response is to think “what can I learn from this and what can I add to my training to ensure that I pass next time”. To be fair, most people ask the question and go away with the determination to change, but often the normal routine gets in the way and they fall back into their old training schedule and old habits. Unfortunately hours in the dojo alone are not going to change anything if they are not spent wisely. As some self-help guru or another said “the more you do of what you do, the more you get of what you have got”. The first thing to do is to make sure you understand the examiners’ feedback. Ask for clarification if you are at all in doubt. Consult your instructor on what you need to bring to your practice to overcome the challenge you are facing. Make sure you get the chance to train with people who are of your own level and above. If this means travelling, then make plans to do it. Start as soon as possible. As in the case of the seminar I just attended, we try our hardest to show people what to do to improve their kendo. Unfortunately learning new skills the day before a grading exam seldom helps. You need to do at least three months of consistent training to make something an integral part of your kendo behaviour. Is 3rd dan the new 4th dan? I am lucky enough to travel regularly for kendo and have been a panellist for or assisted with grading examinations in a number of countries over the past few years. During this time I have noticed that it is generally becoming more difficult to pass 3rd dan. In the past it was often enough for a candidate to show correct waza and good posture to pass this grade. In some ways it was seen as a more polished version of 2nd dan. 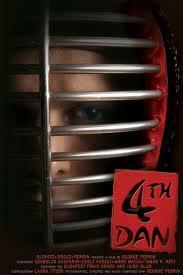 Now, I feel that it is becoming the watershed that 4th dan used to be. An experience that I have not had for quite a few years is to watch a prefectural grading in Japan, but I have been told by a number of senior sensei that the bar has been raised there too. Japanese grading panels now look for sharpness (sae) of strikes and for the ability to make opportunities through seme (breaking your opponent’s centre) or hikidasu (pulling him in), for third dan candidates in the way they looked at 4th dan in the past. Although purely conjecture on my part, I imagine that this is a reflection of the fact that since 9th dan was discontinued, the kodansha grades of 8th, 7th and 6th dan have become more difficult to attain and slowly but surely there has been a trickle-down effect on the grades below. 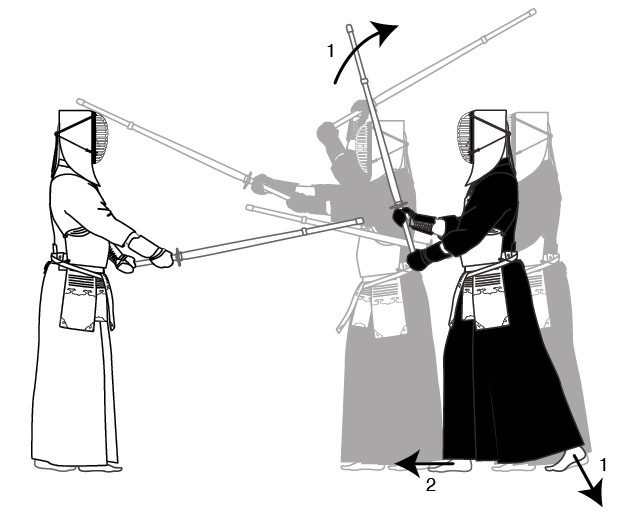 Third dan seems to be particularly in the firing line, because 4th dan was traditionally seen as the point where strong kihaku (strength of spirit), seme and hikidasu were required to augment the technique learned up to that stage. These elements now seem to be required for 3rd dan too. Third dan candidates still need the basics of good cutting technique, posture and ki ken tai-itchi, but must now demonstrate the ability to control and dominate the opponent and to make sharp effective attacks at the right time. Show the examiners that you mean business by ensuring that you are tuned into your opponent from the time you step into the shinsa-jo. Engage your partner’s attention and keep eye contact from the moment you start to bow. Then take three confident steps into simultaneous sonkyo before standing-up together. Allow the time to read each other and show strong kiai before an attack is made. To prepare you should ensure that you work on creating correct opportunities in jigeiko and by including seme and hikidasu in your basic uchikomi drills. 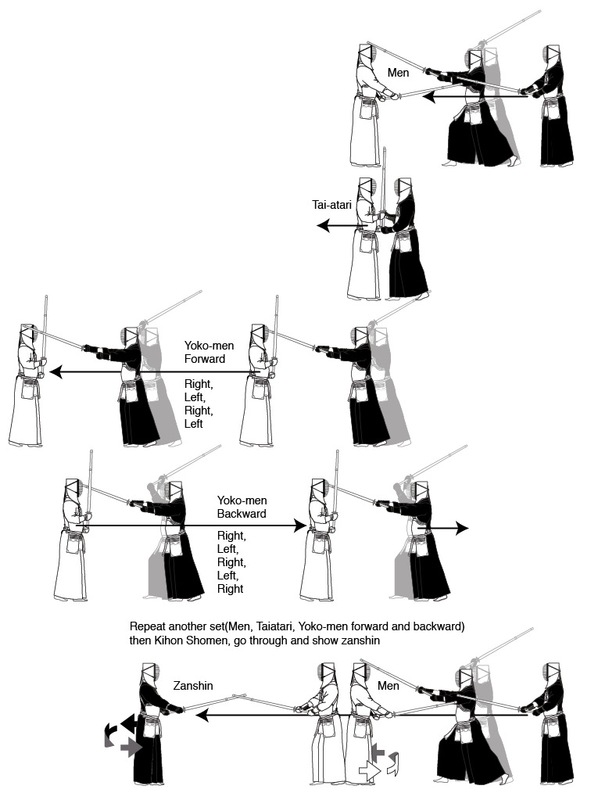 If you are able to combine good basic kendo with the ability to control your opponent at this stage, you should have a great foundation for the rest of your kendo career. I just got back from a weekend kendo seminar and grading examination. As well as kihon and kata practice we had two keiko sessions where I was impressed by the fighting spirit of most of the people who trained with me. At the conclusion of the seminar I advised the candidates for the subsequent exam to just relax and display their best kendo; which many managed to do, but in some cases minus the element of fighting spirit. What we saw instead were what appeared to be nicely choreographed displays of technique with clear opportunities being taken in turn with little or no resistance. Grading panellists are looking for positive evidence of candidates’ ability to demonstrate all the key elements of kendo: correct cutting, good posture, hand and foot coordination, timing, the ability to make and react to opportunities and of course fighting spirit. These elements are required in varied quantities in line with the grade being taken, but at any level, you need to show that you are there to fight. By fighting spirit I do not mean raw aggression, the feeling I am trying to describe is more like ability to keep a reservoir of energy centred in your abdomen so that you are constantly ready to step in and take the initiative and when you see the target to explode into action. At its best it is a combination mental attitude and correct breathing technique that allows you to commit 100 percent to an attack; win or lose. At the early stages of our kendo careers it is difficult to rationalise applying pressure to our opponent whilst at the same time relaxing, but it gets easier to achieve the more kihon training we do. We can accelerate progress by actively developing the right attitude. By this I mean that even in the most basic drills you should try to make “mind contact” with your opponent and to always think about how you set up each technique by making your opponent move. This leads us into the concept of sen, sen sen no sen and go no sen, but whilst this is not difficult to understand on an intellectual level, the physical ability to make and take opportunity is one of the most difficult ongoing parts of our kendo training and can only be achieved through constant correct training. So if you failed on this or a recent occasion don’t be discouraged, get back to the dojo, relax your shoulders, take a big breath, centre your energy and get back to kihon training with lots of confidence and controlled aggression. Your kirikaeshi says a lot about you. I have written on several occasions about the benefits to be gained from practicing kirikaeshi. This time I wanted to share some thoughts on just how much kirikaeshi can tell others about your kendo. I got home last night after the Watchet kendo seminar and grading. In the past in the UK, it was only necessary to include kirikaeshi in grading exams up to third dan. Now to align with other European kendo countries, its inclusion has been extended to 4th dan examinations. With this in mind we did some work on kirikaeshi over the weekend and then as a grading panellist I watched 3 hours of it on Sunday, so as you can imagine, the topic is fresh in my mind. It really is a very good indicator of an individual’s overall kendo level. A demonstration of kirikaeshi is not affected by the relative strength of your opponent, it is a simple showcase for your kendo basics. It gives examiners a clear view of your ability to cut correctly with tenouchi, your footwork and ki- ken- tai-itchi and the strength of your kiai. When as an examiner you watch kirikaeshi the first thing you notice is whether or not the candidate is demonstrating “full spirit”. A big kiai and the ability to make successive strikes in one breath will immediately get the panel on side. It is also easy to see whether the attacker is making correct cuts to the target. For yoko men this should be a a 45 degree angle to the temple and the right arm should be extended and the left hand should remain in the centre of his or her dou mune. Many kendoka get into the habit of aiming at the opponent’s shinai rather than really trying to hit the target. When they are practising in their own dojo, they should get motodachi to receive the strike as close as possible to their men to encourage a correct cutting action and hasuji. It is also obvious if correct distance is being kept. This is usually a good indicator of someone’s ability to control their footwork. One question I was asked several times over the weekend was whether tai-atari should be included in kirikaeshi in gradings. There are various schools of thought, but the simple answer is include it if you have to and don’t if you don’t. For instance if motodachi offers strong resistance, make tai-atari, if he goes back after your first strike, then there is no need. Of course there are other elements of kendo such as timing, opportunity, seme and the understanding of riai that are not visible in kirikaeshi, which is why we go on to a jigeiko demonstration, but kirikaeshi certainly gives the panel a quick overview of a candidates level of competence with kendo’s fundamentals.